I'm new here, since I've just entered the foray of becoming an Alesis Drummer - and I'm loving it! Twenty-some gigs in so far and my new DM10X Mesh kit is performing like a real champ! I love how I can dual layer my sounds. I had a really nice deep bass drum, and a wet, punchy one. Combining them was simple, and my bands love the result! I'm still getting used to the switch from full-on acoustic to full-on electric, but I'm liking the change! Cheers! I'm glad to have found this forum!!! 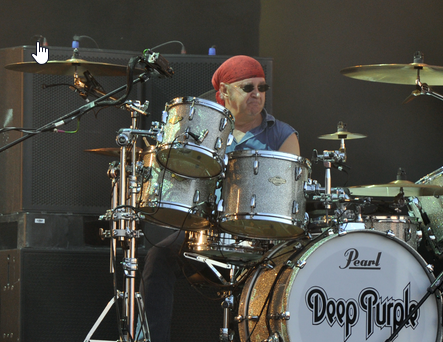 You sure you are not Ian Paice from Deep Purple? My Singer just got me a new TurboSound iX15, a 1,100W powered speaker w/ 15" low end and a nice high end horn. Got a great little app for my Android phone that (via BlueTooth) lets me adjust everything in the menu from the back panel. Yeah... Now I, too et to feel the thunder!!! Loving this kit! I'd also like to add that, since I started with this kit (started gigging right away) I've really come to appreciate more and more of the abilities available through the module. I've been tweaking all of the various options regarding sensitivity, cross-talk, threshold, etc., and really fine-tuning how this thing responds. This forum has been the perfect place for advice. Gigging getting very intense right now, so I'm not here as often as I'd like... but I do Love this place and sneak in for a read as often as I can. My singer that I keep bringing up owns a sound company. On the Fourth of July this year, we got to experience my thunderous DM10X through the very top-end JBL Sub-Lows (a nice wall of them) and the rest that accompanies all of that. Woah!!! The more I play these different kinds of gigs, indoor, outdoor, loud, not-so-loud, etc., the more I find myself fine-tuning and learning how amazing this kit really is. It's SO different from acoustic drums (of course) that, right from the start, I decided to use much lighter sticks to reduce wear-and-tear. It must be working because my kit still looks new after about a year and a half of gigging. I use Armor All Matte Cleaner wipes on my cymbals to keep them clean and soft. I also use a king-size sheet to cover the kit when I'm not playing, and cases to transport. I absolutely LOVE playing this thing! Did you layer the bass voices in the module? Prolly not, I think - I haven’t seen anything like that in my module (yet) but I’m a noob. Yes. There's a single bass drum option that I absolutely love in my headphones, but pumping through massive PA system is a different story. I've been seeing the same sound engineer ask for different things at different places. So I have one (A) for the punchy attack (the one I love through my headphones) and another (B) for a deep thump. Makes it really easy and quick to give the sound guy what he's looking for. I'm using my midi IN for a Sample Pad Pro at the moment, or I'd try rhysT's method of layering the snare into four - but I used his idea with the random timbale layered in with the main snare sound. Really helps to add dynamism! WOW! Pearl's DM10 (R.E.D. Box) looks promising! I was beginning to fear the idea that there's no longer a solid DM10 module on the (new) market. I didn't think there was anything quite like the DM10. I can literally switch kit presets mid-song with no hesitation. I have six kits currently that all use the same base kit but change rim triggers and such... some just change the midi settings on the Sample Pad Pro, and there is no audible change or loading time when I switch. It's understandable that modules like the Strike have loading times. I get that. I really want a Strike. But when I get my Strike, I also want to keep my DM10 as part of the kit. DM10 mkII Pro Extreme, eh? I think that title belongs to the Strike, doesn't it?! Lots of heavy gigging this year. Just constant. Loving it! DM10X Mesh kit is still holding up like new. I'm still feeling myself learning how to better play e-drums compared to acoustic. The DM10 sure makes it a friendly switch though. I really love how I can get a good warm up in before we play while my kit is muted. The smallest amount of ambient room noise, like busy people talking, makes my kit entirely stealth for sound. 15" 1,000W powered speaker makes a huge difference for helping the 'feel' during live shows. The 12" is nice, but the 15" really eliminates those times when the kit disappears amongst the other instruments on stage. I'd also like to add (I may have already...?) that, when I first ordered my DM10X Mesh, I had already wrapped my head around the idea that This is a New instrument to learn to play, rather than expecting it to be a literal acoustic drum simulation. I've spent years doing public drum solos and, in that endeavor, have practiced many ways to get new sounds from the same drums by how I approach the heads with my sticks or hands. E-drums are different. They have to be. I chisel stone and try to take really good care of my tools. I use a whetstone on my chisels, never a grinder, and keep all my tools nicely rubbed with oil. So in playing my new e-kit, I've adopted a lighter playing style with lighter sticks than before, and set my sensitivity levels accordingly. I find myself loving this whole new exploration in drumming, and the kit seems to love it too. Although heavier and bigger than the sticks I've been using, I feel that these Firestix trigger my pads (mesh and cymbals) a quite a bit more responsive than my wooden ones. Being a Star Wars fan, it's a bit of a win-win for me! I have a pair of those! I bring them out for a song or two during a show. It's a great way to get the crowd going, they love the light-up sticks! Normally, I've been using Ahead 5A MAXX sticks. They're a little heavier than the wood sticks I was using, so switching between them and the light-up sticks isn't as dramatic a change. Sweet! I definitely want to try a pair of those! One thing I've noticed about playing e-drums during live gigs is that I find myself accidentally pounding harder during times I can't really hear myself all that well. E-drums being what they are, it doesn't wreck the sound output through the PA, so no harm there... but it does have an impact on the longevity of the internal parts of the e-drum pads and their Piezo transducers. I still think it's important to use a powerful speaker to offer some stage presence, but I'm also planning on getting my own in-ear monitor system to completely alleviate the whole "I can't hear myself well enough" issue. Not all gigs are the same, as far as being able to hear. For example, in tight spots it can be hard to get the speaker far enough away, so the sound misses me entirely. I think I've finally got myself to the point where I no longer play harder if I'm having a hard time hearing myself play. I just keep playing and hope for the best. When it comes to playing e-drums - at least for me - hearing IS very important, so I know that I'm playing the dynamics I want. These wonderful playing surfaces really don't need to be slammed hard - and I like that. I bought a pair of Rockstix because they change colors. I love to turn out the lights and play Inna Gada Da Vida. Pure psychedelic. I think mine are actually the Rockstix, but they're just the blue ones. I want to get a set of the red and a set that changes colors!